Every day I ask my daughter, “Tell me three things about your day today?” It seems like a good jumping off point for an open dialogue relating to any part of her day. After having been down this parenting road for a bit, I have learned that asking a child, “What did you learn in school today?” will inevitably garner the response, “Nothing.” Time spent on the court is a learning experience as well. It should be easy to come up with at least three things that you obtained in your lesson, or match. Keeping in mind that the time on court extends beyond hitting the ball. Maybe what you learned wasn’t necessarily relating to a particular shot. There are human interaction lessons, scoring lessons, shot selection and so much more. When going to the school of tennis, finding the right teacher is paramount. Tennis School Basics – How do you learn? In previous posts, I have addressed the importance of understanding what kind of student, or learner, you are, in an effort to better help your instructor instruct. There are, however, certain factors that you can take into consideration in order to find the right coach for you, or your child. Tennis instruction is an investment of your time, your money and yourself (mentally, emotionally and physically); and for that reason your tennis instructor should be working to make your time as positive as it can be. Teaching, by nature, is an art. Not everyone can communicate effectively to ensure a valuable learning experience. Much like high school, college or a job conference, just because a person “knows the material,” doesn’t guarantee that their delivery will be considered informative. There are any number of former college players who may hit a great ball, but lack the teaching experience, or communication, needed to give a productive lesson. Tennis School Basics – Know your tennis coach. It is important to know your coach’s qualifications and background. Are they PTR or USPTA certified? 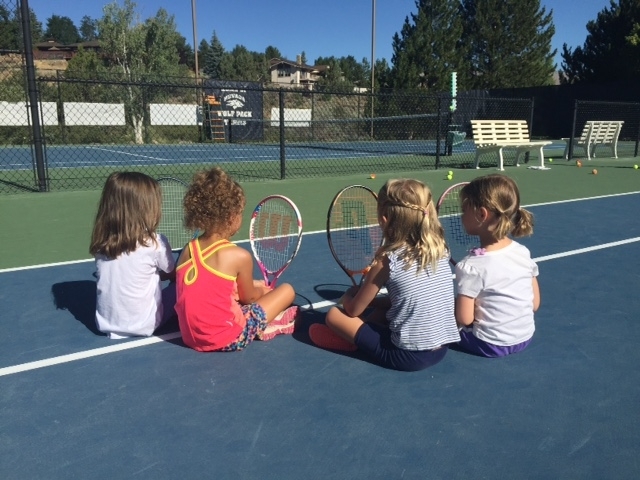 USPTA certification encompasses more than just tennis lessons. With the USTA’s “10 and Under Tennis” initiative, tennis pros have to be knowledgeable in the new standards for junior tennis. Instructors are required to know appropriate court dimensions, type of balls and net height for children. In addition, the USPTA requires knowledge of equipment: frame selection, string patterns and string types. The USPTA ensures that their coaches are familiar with modern tennis techniques, as the game moves away from traditional serve and volley, to power groundstrokes. Finally, those pros that are USPTA certified, are required to participate in numerous continuing education opportunities, so that you can be assured that your coach is current on all the latest news in the world of tennis. Enjoying the “subject matter” is the easiest part of tennis. It is obvious you love it, because of your commitment to the lesson, or the program. It is imperative, that you also get the feeling that your coach loves it as well. The best teachers are those that are knowledgeable within their subject matter, a student within their own right, an effective communicator and someone who is excited and energized to share their insights with you. Answering the question, “Tell me three things about tennis today” is easier when you have a teacher that can make learning the game less like school, and more like recess.